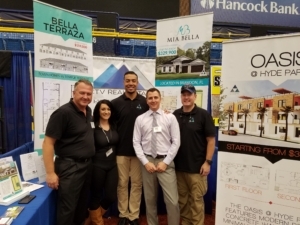 On the 3rd, 4th, and 5th of November 2017, CEO Vincent Jackson led his CTV Team at the Tampa Bay Home Show. This was a great opportunity to connect with the Tampa Bay community and share the new projects that CTV is building and the services that The CTV Family of Companies provide. The Agents of CTV Real Estate handed out t-shirts and other goodies along with valuable information about available real estate properties and programs. There was a raffle for a football autographed by 3 time Pro-Bowl Wide Receiver Vincent Jackson and other prizes. This was a great opportunity meet and speak with Mr. Jackson on a personal level. Be sure to stay tuned for future events!